Leapfrogs is a healthy pre-school & nursery and this is reflected in our healthy snack policy. We believe healthy snacks play an important role in managing childrens’ hunger, boosting attention levels and promoting happiness. They also give your child the vitamins and minerals he or she needs to grow and develop properly. 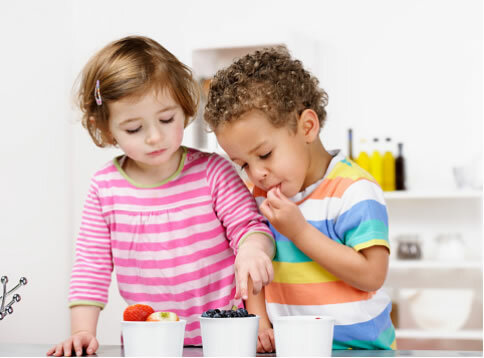 We provide a variety of healthy snacks that should provide your child with the important nutrients they require, such as calcium, fiber, iron and vitamins. We also ensure they are low in calories, fat or sugar. By providing and encouraging the children to eat healthily, we hope they develop lifelong healthy eating habits. We do appreciate that some children may have individual or specific dietary needs due to certain medical conditions. We will always work with you to accommodate these needs. Our school meals are prepared and planned by Herts Catering Ltd. They specialise in providing a superb range quality meals for schools across the County. The choices always include plenty of fruit, vegetables, and salds. For information about their ingredients, and the services they offer (including menus etc) visit their website. They are currently priced at £2.20 per day, paid in advance either daily, weekly or termly. Please contact the Gail or a member of staff for more information.